I had a bit of a slack week last week as far as the blog is concerned. A combination of lots of working late and of uninspiring dinners meant that there was little to blog about. I discovered that my favourite dish of crab linguine done with spiralized courgette doesn’t work – it looks beautiful but is bland and watery and a bit of a waste of 5 quid’s worth of crab meat. I also had great intentions for some peaches with Parma ham and mozzarella but they went and did an avocado on me – rock solid and unripe to wrinkly and moldy with nowt in between. And there was a lush creamy salmony pastary thing that was gorgeous but not really worth blogging as I had had a glass or two of wine so have no idea what I put in it! 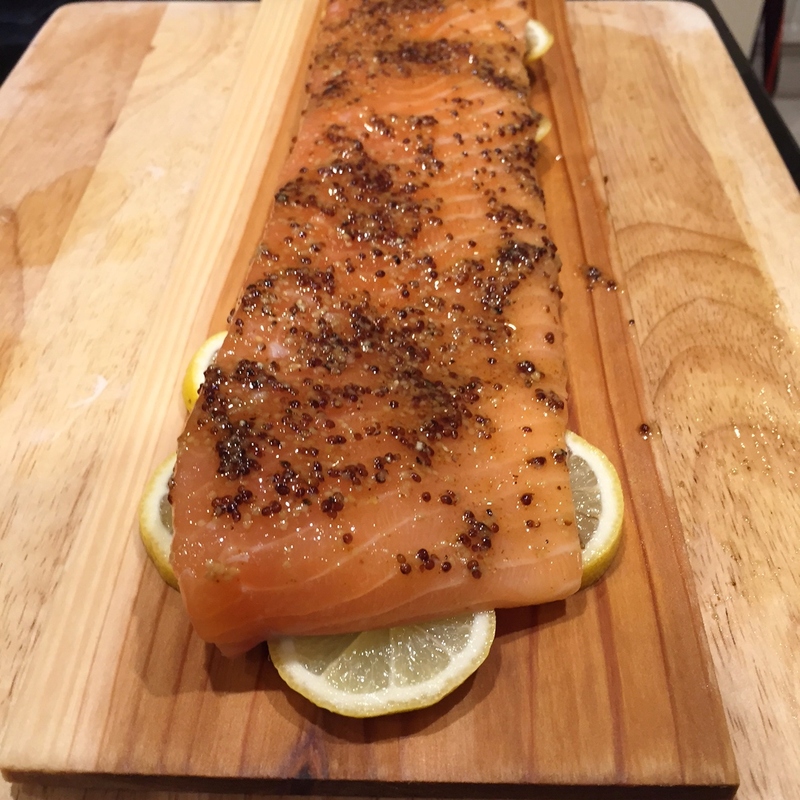 So Sunday arrived and with it a pescatarian friend over for the week from New York. And I go my mojo back, well some of it. I reckon it was the last of the British summer on Sunday so the BBQ was lit and we had the same dish we cooked the last time we used the BBQ back in February. 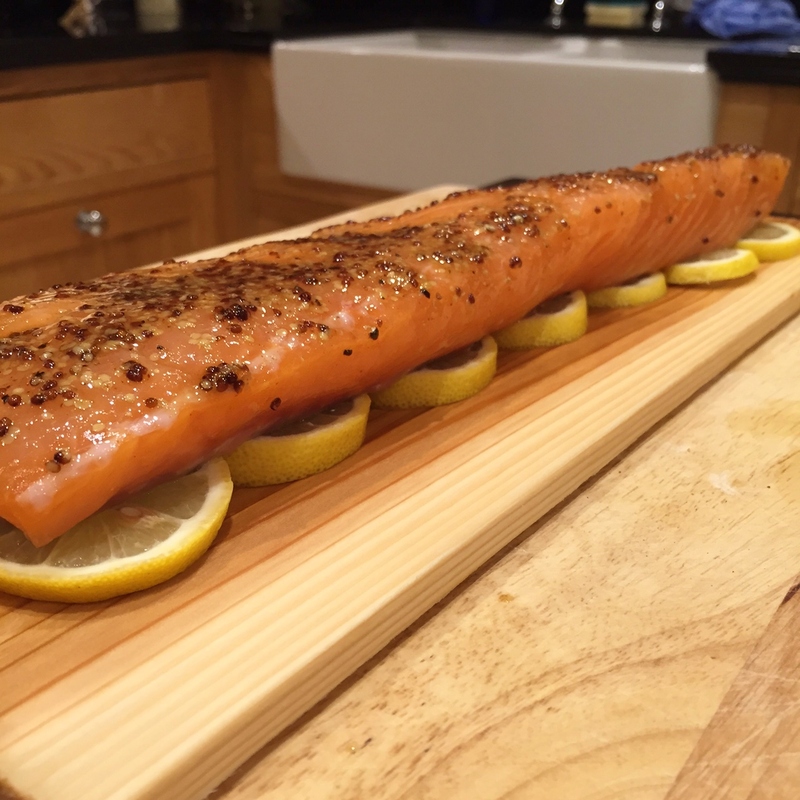 Cedar plank salmon. Easy-peasy. I mean really easy so I feel bad posting this as a ‘recipe’ but I’m a little short on material at the moment! I’ve bored myself typing this, as it’s really not that exciting. But do trust me on this, it tastes fantastic and is actually quite healthy. No idea if it can be done in an oven, I suspect it can, however, you’ll loose the smokiness you get from a BBQ. So if you don’t fancy reading this now, don’t worry – I’ll probably re-post it next May.